When you’re driving a boat – just like when you’re driving a car – you have a lot to think about. You’re concerned with the passengers on your boat, other boats in the water – and unlike cars, you are often towing a wakeboarder or skier behind you. Plus, that person usually wants to hear music. 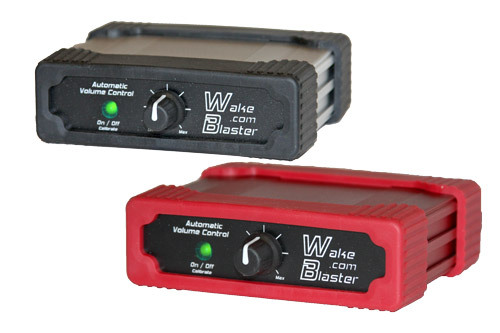 Enter WakeBlaster, an automatic volume control device for your boat stereo. WakeBlaster is designed to automatically increase the volume of your stereo when pulling a skier out of the water, and automatically reduce the volume when slowing down to recover a skier in water. WakeBlaster works by sensing the bow angle of your boat. If the bow is up, the volume goes up. If the bow is down, the volume goes down. It’s simple to install and use, and it’s one of those things you’ll not know how you managed without. Place your order now for the convenience and safety you and your passengers want! To place your order, pick the color of WakeBlaster you want, choose your stereo brand and click the “Buy it Now” button. Orders typically ship within two business days via Priority Mail for $12.50.